A little bit of spare time turned into hours of fun!! 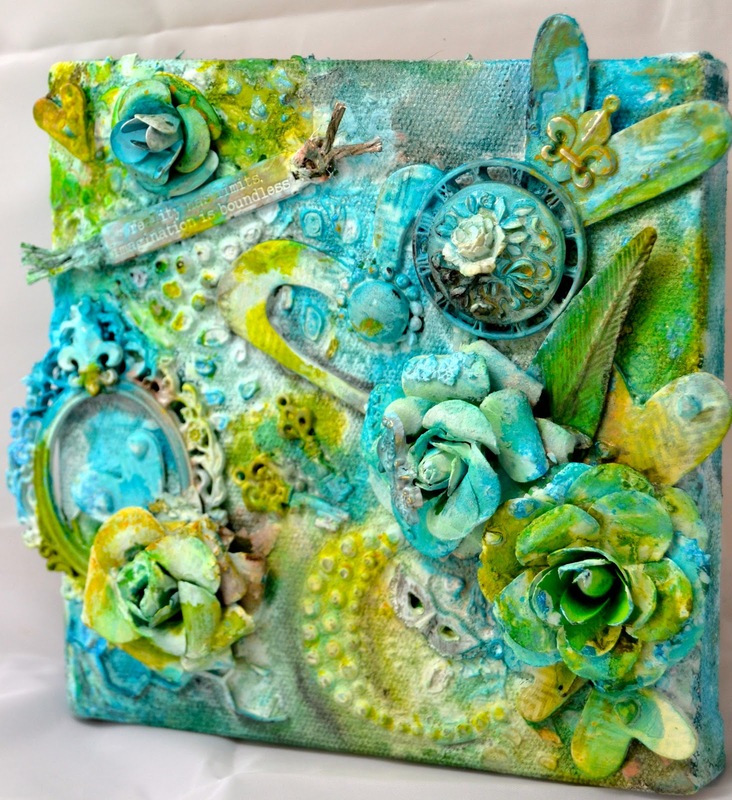 This canvas is fun and inspired by Finnabair's work. I love how you can spray color all around and watch it run and turn into other colors. I love how the textures come out and some unexpected really cool things appear. Making a canvas like this is artful discovery of your thoughts, it relaxes me. 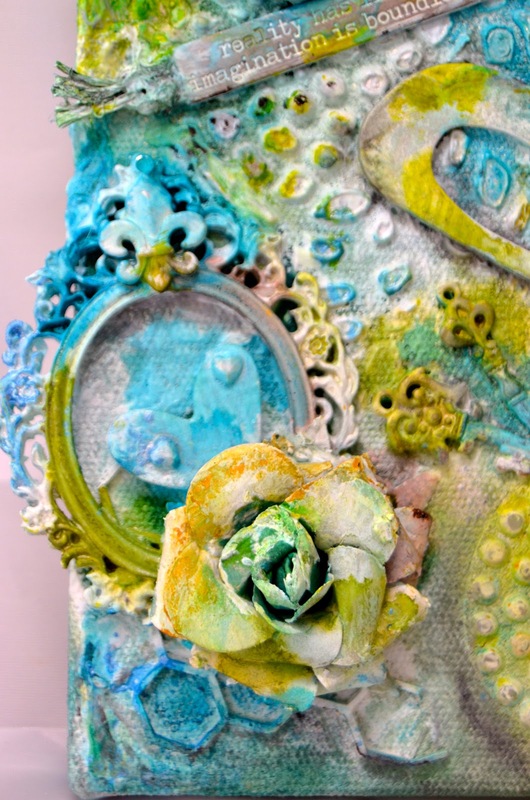 First came the Gesso then the Finnabair doily mask......many color changes. Having a smartphone is great when you are unsure of the direction you should go. I sent a photo and asked for advice from a dear blogger friend. It is such a blessing to have a friend you can just text and ask, thanks Karen. Here is the end result of the canvas, I just love the colors and all the trinkets that are in it. Hope you have a very crafty weekend or adore some of the new babies I am seeing on Facebook, congrats new grandmothers! Very pretty, Kelly my girl! I love those colours and it is a gorgeous canvas! 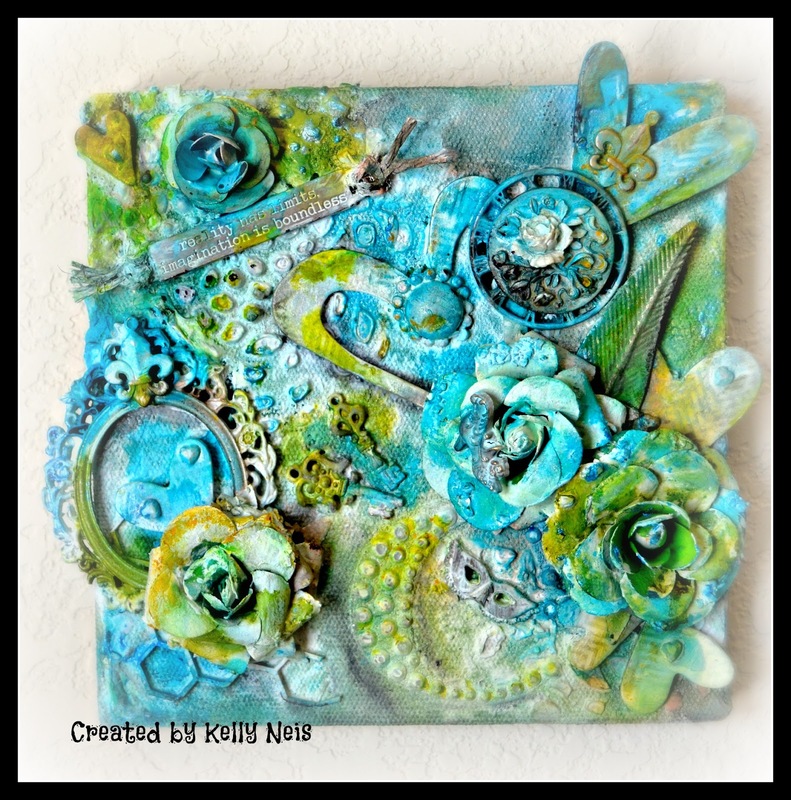 Oh wow Kelly this is just beyond gorgeous with awesome aqua colouring and textures. I can see you had a lot of fun. You are such an expert putting together a canvas, Kelly!!! I looove the gorgeous colors. Great texture and awesome elements on this work of art!!!! You have created so many beautiful colours on this canvas - with so many gorgeous underlying elements! Awesome work! Wowzers another amazing canvas. Looks like your really enjoyed putting this together and your coloring is gorgeous! Great job! 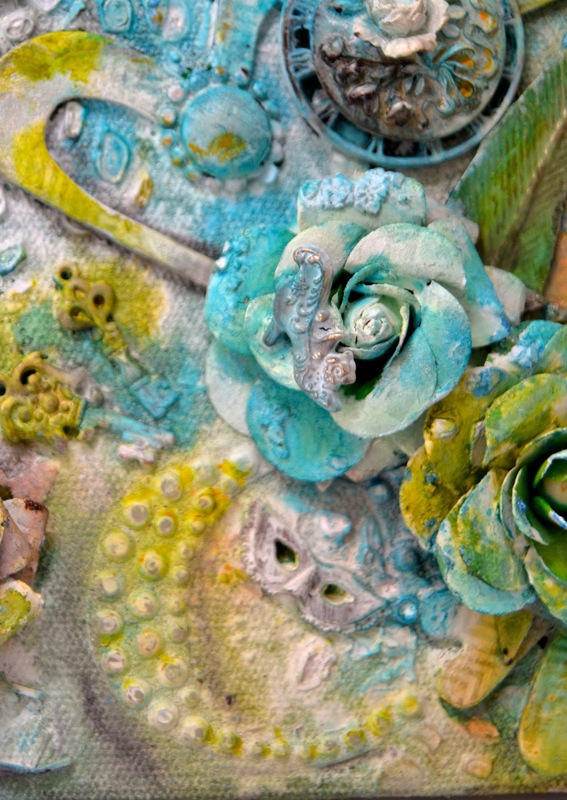 Yum, yum, yum... some of my favourite colours - glorious embellishing and composition - this is another amazing canvas, Kelly ... you're on a wonderful creative roll.